Five CIVS students won awards at Purdue Northwesta��s 2016 Student Research Day. Three recent Purdue University Calumet engineering students collaborated with the university’s Center for Innovation through Visualization and Simulation (CIVS) and the Association for Iron & Steel Technology (AIST) in developing an innovative tool that enables greater worldwide understanding of the steelmaking process. For their senior design and graduate research project, the now graduated students worked with AIST staff members and CIVS faculty and staff to create an online, interactive resource. Called the Making, Shaping and Treating of Steel Wheel, it includes three-dimensional imagery and videos plus descriptive text on each part of the Wheel:http://apps.aist.org/SteelWheel/index.html. By starting in the middle of the wheel, viewers are introduced interactively to the fundamental ingredients used in the ironmaking process to produce elemental iron. Those ingredients are iron, carbon and calcium in the form of iron ore, coke and lime, respectively. By clicking onto other aspects of the wheel, users can track additional steps in the steelmaking process. By applying engineering principles and lessons in helping develop the Wheel, the students satisfied their degree requirement. The Colorado School of Mines’ Advanced Steel Processing and Products Research Center joined AIST as a project collaborator. Purdue Calumet Professor of Mechanical Engineering and CIVS Director Chenn Zhou referred to the project as another demonstration of how Purdue Calumet students, faculty and staff are using CIVS to assist and benefit business and industry. As an interdisciplinary applied research center, the campus-based CIVS combines advanced simulation techniques with 3D visualization technologies to provide innovative solutions in response to industrial and other problems and challenges. Through close partnerships with more than 90 external organizations, CIVS has enabled projects that have produced substantial educational and economic impacts in fact, more than $38 million in savings by the external partners. Recently, CIVS has worked with the steel industry to establish the Steel Manufacturing Simulation and Visualization Consortium to improve the competitiveness of steel manufacturing across its value chain. AIST officials refer to the Wheel as a one-of-a-kind experience that allows individuals to click onto each phase of steelmaking to gain a deeper understanding of the process through videos, photos and detailed explanation of functions, equipment and materials used. AIST identifies its organization as a non-profit technical association of 17,500 members from more than 70 countries, with a mission to advance the technical development, production, processing and application of iron and steel. Article taken from the Purdue University Calumet website, published January 19, 2016. 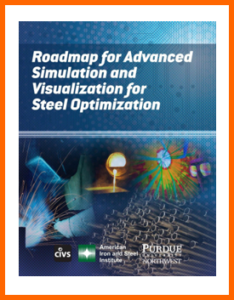 A technical paper written by researchers of Purdue University Calumeta��s Center for Innovation through Visualization and Simulation (CIVS) and AK Steel about a way to improve steel production based on a concept developed at the steel companya��s Dearborn, Mich. Works has been selected to receive a national award this spring. The paper, titled a�?Investigation of Co-Injection of Natural Gas and Pulverized Coal in a Blast Furnace,a�? will receive the Association for Iron and Steel Technologya��s (AIST) 2016 Josef S. Kapitan Award-Ironmaking, May 16 at the AIST conference in Pittsburgh, Pa.
AK Steel Technical Manager, Ironmaking Stuart Street initiated the collaborative project to utilize the unique skill set available at the Purdue Calumet CIVS research facility, as well as to support further advances of industry-university research. The research team includes lead writer and Michigan City resident Tyamo Okosun, a Purdue Calumet alumnus, CIVS research assistant and Ph.D. student at Purduea��s West Lafayette campus. Other team members are Street of AK Steel, former students Yan Chen and Jiaqi Zhao, and Purdue Calumet faculty/staff members Chenn Zhou, CIVS director, and Bin Wu, CIVS research engineer. The industry-funded project utilized the CIVS for computational fluid dynamics modeling and analysis. The researchers conducted a parametric study of blast furnace operation, exploring ways to increase performance and efficiency. More specifically, they explored the use of natural gas as the carrier fuel for pulverized coal injection (PCI). PCI has been utilized in blast furnaces for decades as a substitute for reducing undesirable coke. a�?Ultimately, the goal is to improve the fuel replacement ratio by replacing coke with coal and natural gas,a�? Okosun said. a�?The less coke used, the cleaner the gases.a�? As expressed in their paper, the researchers determined that natural gas utilization for pulverized coal injection could improve total burnout from 77 percent to 87 percent. Their research also uncovered the likely cause of wear and ablation in the configuration of blast furnaces. Finally, they discovered that natural gas as the PCI carrier also potentially could improve blast furnace productivity by some 2.5 percent. a�?This project has been a wonderful learning experience, combining industrial know-how and direct collaboration with our partners. I have learned so much from our industrial advisor, Dr. Street,a�? Okosun said. a�?The topic of this research will be carried on through the newly established Steel Manufacturing Simulation and Visualization Consortium.a�? Purdue Calumeta��s CIVS is an interdisciplinary research facility that combines advanced simulation techniques with 3-dimensional visualization technologies to provide innovative solutions in response to industrial and research challenges.